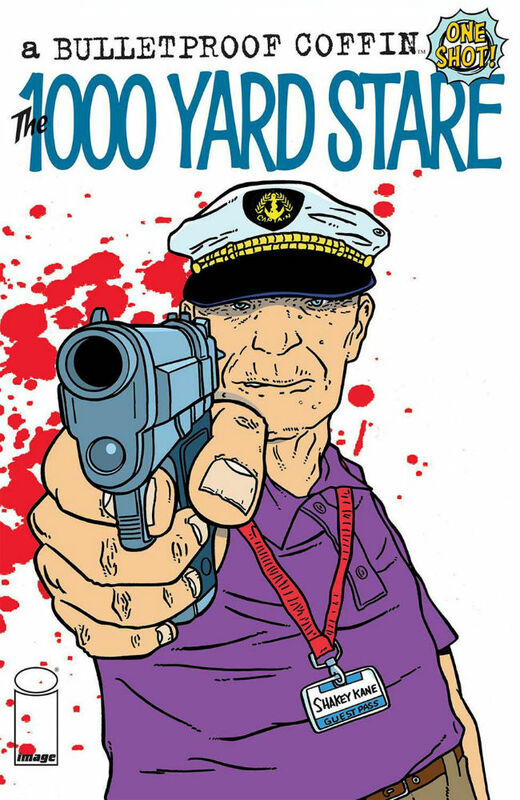 Staff Picks for June 7, 2017 – Bulletproof Coffin: The 1000 Yard Stare, The Flintstones, Magnus and More! It’s nearly Wednesday, and you know what that means: a fresh load of comics and graphic novels! With so many publications hitting your local comics store or digital storefront, the BF team are here to lead you through the woods with our weekly staff picks. Satisfaction guaranteed! Comics can take us places that we can’t often go on our own. Some whisk us away to strange fictional worlds and show us things that are beyond imagination; while others draw back the curtains to show us insider glimpses of realities we otherwise may not have access to. And, well, some are just plain weird. It’s a rare and exciting thing, then, when all of these great qualities come together in a single comic. Veteran creators David Hine and Shaky Kane achieved this perfect storm when they teamed up for the six-issue Image Comics miniseries Bulletproof Coffin back in 2010. The series not only bent the lines between fiction and reality, it also hit the sweet-spot of countless fans who were searching for something a little different. They followed it up with a second six-issue batch called Bulletproof Coffin: Disinterred which further experimented with the fundaments of the narrative/art relationship. This week, Hine and Kane are back for the highly anticipated Image one-shot Bulletproof Coffin: The 1000 Yard Stare. When Kane is green-lighted to write and draw his own comic, free from the hassle of drawing Hine’s tired stories, petty jealousies lead the two into a brutal tête-à-tête on the comic convention floor! This new one-shot promises to continue the great things that made Bulletproof Coffin an instant classic and a fan favorite – a boiling pot of fiction, reality, and weirdness pressure-cooked into a thrill ride of words and art that only Hine and Kane can deliver. It’s a disappointment, then, that the book perhaps failed to find the wider audience that it deserved but it reaches its twelfth issue finale on a high. 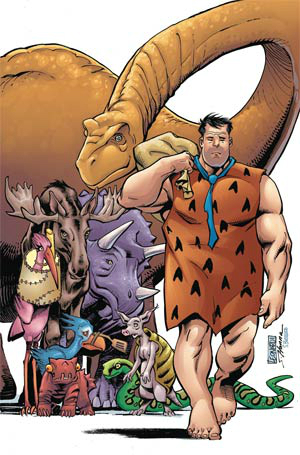 We bid a fond farewell to this very different but always oddly recognisable take on the Flintstones, the Rubbles, Dino, Mr. Slate, the Great Gazoo and co this month. If you’ve not picked up the single issues we cannot recommend the trade collections more highly. In what hardly seems to be much of an imaginative stretch, a not-too-distant future version of American lies divided by greed and racism. Violence and fear rule the day, and just when it seems the two sides couldn’t get further apart, a “worst case scenario” terrorist attack destabilizes the country even further. if you’re in the mood for an “on the nose” dystopic suspense thriller about the fall of the American empire, there’s no one better at it than American Flagg and Black Kiss creator Howard Chaykin. This one is sure to catch some headlines. Two years ago I had the pleasure of interviewing creator Sam Bosma about his first Fantasy Sports book from Nobrow when I chaired a panel on creators with a self-publishing background at 2015’s ELCAF. 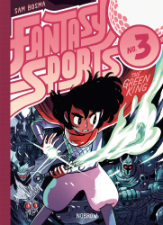 Bosma’s large format albums reach their third high-energy edition this month with another offering of sports style comics with a magical twist. This time around our protagonists Wiz and Mug become involved with a game of supernatural mini-golf when they find themselves washed up in a town that has been taken over by a monstrous ruler. Revisit Bosma’s ever engaging world this week in another instalment of this amiable comedy-adventure. But not all AIs are okay with this arrangement—here’s where the Blade Runner Roy Batty elements fragment society’s delicate balance. Enter Magnus, a human psychologist charged with the task to traverse both worlds and return the wayward AIs back to productive society. 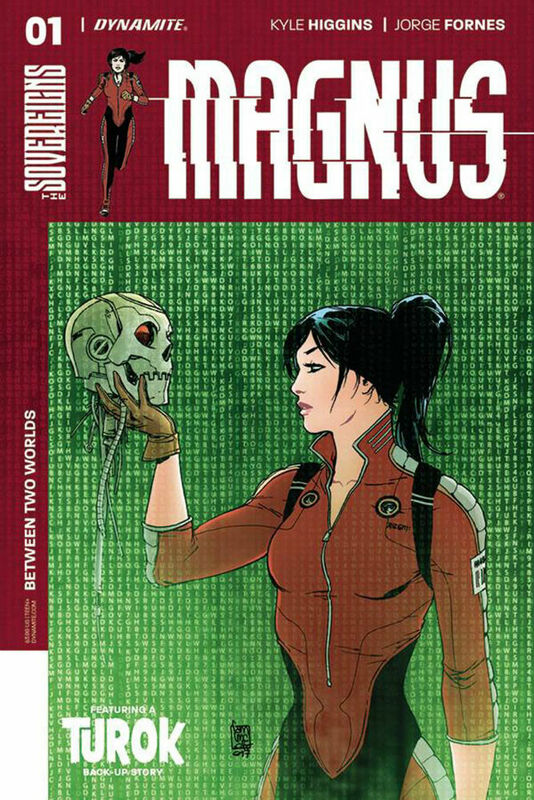 It seems like a straight-forward assignment, but Higgins is way too gifted in the art of placing his protagonists in situations that quickly escalate from simple to impossible to let Magnus discover a quick resolution. Where’s the fun in that?! Expect layers of political and social intrigue to complicate Magnus’ life from the start and well-crafted action sequences that drive the plot forward. I expect Higgins and Fornes to deliver a fun sci-fi ride that also makes you think. Includes a bonus Turok back-up by Wendig and Sarreseca.